The Open Veins of Latin America: Disowned? 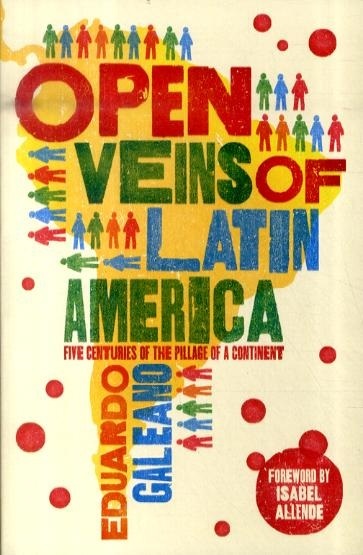 Forty-three years after its publication, the emblematic and widely read Latin American anti-colonialist bestseller The Open Veins of Latin America has been disowned by its creator, 74-year-old Eduardo Galeano – but its literary message remains vital. Interviewed last May about the book often called the “Bible of the Latin American Left,” Galeano said, “I don’t regret having written it, but it belongs to a time that to me has been overcome.” His words left a sense of abandonment and deceit among many, who asked: What had happened to the bleeding veins of Latin America drained by European and U.S. colonial powers? Hadn’t the region been sacrificed since Columbus to profit diabolic foreign interests? When Venezuelan President Hugo Chávez gave President Obama a copy of the book in 2009, was he clinging to an interpretation of Latin American history no longer embraced by the region’s leading thinkers? Others asked, however well-deserved a denunciation of the exploitation and oppression laid out in the book was, were they to be blamed for all of the damage inflicted in the region? Galeano’s interview signaled a refocussing of his analysis rather than wholesale rejection of it. He said Open Veins was too boring and written in a tedious style and with the doctrinal tone of the traditional left. He added that in those early days of his career he did not know enough politics and economics to write a book of such reach. What Galeano has demonstrated by this unassuming recognition is that he has evolved through the years and, like many others, realizes that the dependentista paradigm, with its rejection of western capitalism, that fueled his book had important shortcomings, and overlooked other key problems. He underestimated the impact of weak institutions – anticipated by Bolívar in the early 19th Century – and internal political and economic issues such as government corruption and the unwillingness of the ruling classes to contribute to the development of more democratic and egalitarian societies, as Marx himself would argue when writing about Southern countries. The real – and not insignificant – value of Open Veins today lies in its literary character. Its capacity to capture the spirit, the hope and the rage of those turbulent times in the region lives on. Filled with metaphors and symbolism, it is an essay, whose literary dimension makes it current and ageless. Stemming from a deep Latin American tradition, the book crosses the blurred borders between literature and history, sociology, politics and other disciplines alike. Like José Martí, Ricardo Palma and Octavio Paz, Galeano attempted to transgress the boundaries between literature – subjectivity, imagination and hyperbole – and disciplines based on empiricism and factuality. This practice can lead to challenges over facts, but the messages remain compelling. Elizabeth Burgos’s testimonial account of Mayan activist Rigoberta Menchú in I Rigoberta Menchú (1984) was criticized for alleged inaccuracies, yet it is difficult for anyone to deny that the suffering of the Mayan Quiché community in the 70s and 80s was at least as cruel as Rigoberta depicted in the book. Carlos Fuentes once said that reality will always overpower fiction, no matter how hard writers tried. The intellectual evolution that Galeano has displayed is welcome, and it is also an inspiration to reread Open Veins and Latin America with much-needed fresh eyes.